Text messaging can bring a huge range of benefits to any recruitment agency. It can help improve efficiency in your call centre, saving time and money on phone calls that don’t get answered. Ignoring superb statistics like the fact that 97.5% of text messages are opened within 5 seconds of receipt, or that the overall average open rate for SMS messages is 98%, text messaging provides an added level of convenience to client interactions, giving them the option to deal with tailored job vacancy information as and when they see fit. The additional functionality that the Textlocal bulk messaging system provides is also extremely useful to recruitment businesses; allowing for the easy gathering, storage and sorting of customer mobile numbers. This in turn means that only the most relevant new job information received by each customer, personalising the service received by each, and increasing customer loyalty. Let candidates know when new positions matching their requirements open up and include details of how to apply. Send a text confirming the time, date and location of interviews, including links to attachments of maps and interview tips. Collect the important information from potential new candidates wherever they are, with mobile optimised data capture forms. Send shift reminders to casual and temporary staff to ensure they’re always where your clients need them to be. Check up on candidates placed in the past to see if there’s anything more you can do for them, and if they’re looking for a new position. Messenger can be seamlessly integrated into a wide range of CRM software through our API gateway for smoother communications. 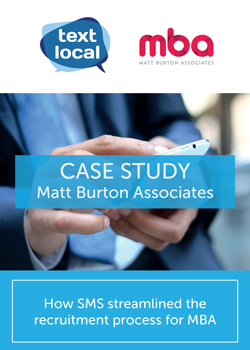 Download our latest recruitment case study from Matt Burton Associates. Textlocal surpasses the vast majority of tech companies with their customer service. Calls are answered first time, every time, and any issues we have are resolved in hours, if not minutes. I cannot recommend highly enough.